Ultimate Poseur: Should Europe get fewer World Cup spots? A very nice piece of work. On 'the plea', I agree that the current 'negotiation' approach is weak, but previously thought that taking a coefficient/ranking approach could simply entrench the current disparity, as if a region is already under-represented, its teams wouldn't have the opportunity to play at the tournaments/in the matches that get them points, and so they could get 'stuck' where they are. However from your figures, using rankings would seem to even things out a little better, so that's a useful insight. Using other figures has some problems - population would particularly invoke the question of India; and any financial benchmark would be inappropriate, I think. Certainly an interesting discussion to start, thanks! Appreciate the kind words and the RT on Twitter, Philippa! 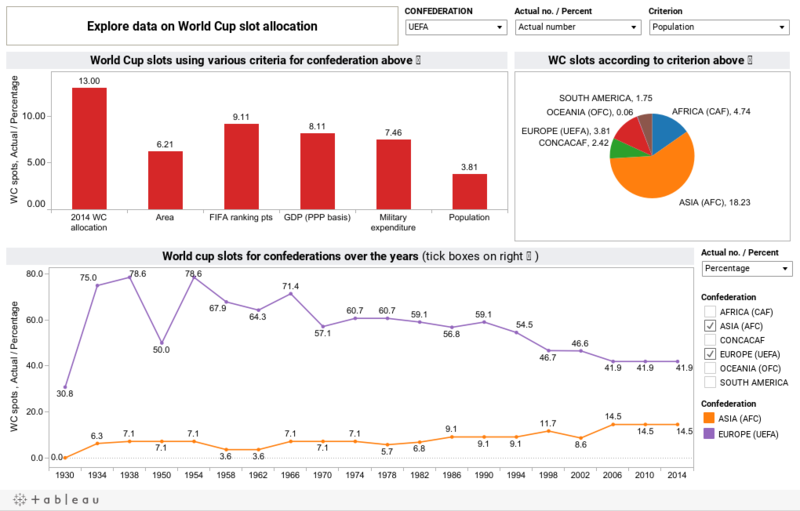 About the coefficient approach, it would seem that nations from Europe and South America would be getting more out of it than most because they routinely do better at world cups but the way the FIFA world rankings work, they also take into consideration regional tournaments and friendlies, so there are plenty of opportunities for the minnows of international football to gain points even if not all of them qualify for the world cup. They certainly seem to deserve more than they're getting now in terms of World Cup slots, especially Oceania. Agree about the use of economic or political benchmarks, was just kind of playing with the idea of re-imagining the world cup in a way that reflected the world we live in. I certainly wouldn't condone it, might play into a kind of 'might is right' approach which I don't subscribe to anyway. But I do believe the world cup could do with being more representative though, the FIFA rankings may not be the answer but it seems like a good place to start! Tableau Online Training Bangalore Blog.